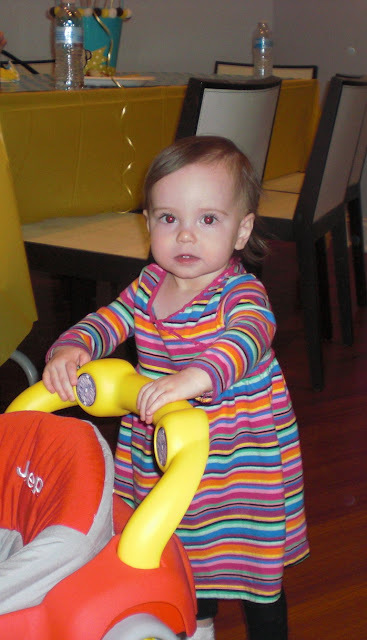 The Suburban Style Life: Jillian is 14 Months! My sweet girl turned 14 months on the 21st of February and I can't believe it's already been two weeks since I have even had a chance to dwell on it. I know I have said this a lot lately but I am going to say it again, we have just been SO busy lately that I can barely keep up with anything in my life right now. Between working crazy hours and having plans everyday for the past several weekends, I am just wore out!!! Thankfully we have absolutely no plans this weekend and things at work look like they may be looking up. I just need a few moments to catch my breath, that is for sure! I don't want to let anymore time pass me by without a post about what my sweet girl has been up to lately. Jillian isn't walking just yet but she is getting stronger and more curious about it everyday. She finally let Jeff hold her hands so she could take a few assisted steps. This was a big deal for her! I have tried so many times to have her hold my hands or my fingers to encourage her to walk and she'll just plop herself on the floor in protest. She is an absolute furniture walking pro though and will try to climb along anything just to stay upright. 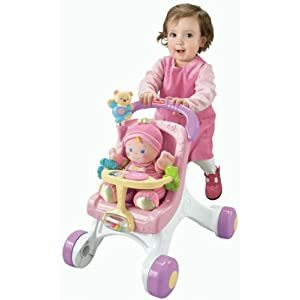 She is also a whiz with her Fisher Price Walker Stroller too and has had a few wipe outs on the hardwood floors. Jillian is for the most part is still an average sleeper. She has been a completely different baby since we let her cry it out, however, we recently went through a tough few weeks where she was getting up at night again and wouldn't go down for naps without a fight and a lot of tears. I was really getting nervous that maybe we were being too easy on her and holding her too long again before naps and bedtime. I also panicked that we were undoing all of the progress we made with crying it out and was so fearful that we were going to have to go through it all over again. One night, Jillian got so herself so worked about going to sleep that she cried inconsolably for twenty minutes. To me it seemed like an hour and I was completely panicked about what to do. Of course it happened on a night that I was alone and Jeff was at hockey. I was so desperate to calm her down so I gave her some Tylenol figuring it was either her teeth or her ears bothering her and called my Mother-In-Law for help. Jeff's parents only live 15 minutes away and I really needed someone to help me. I felt so helpless that Jillian was crying so hard and I had no idea what to do to calm her down. Thankfully the Tylenol kicked in and soothed whatever was bothering her. She fell fast asleep before my Mother-In-Law arrived at our house. It was one of the hardest nights that I had with Jillian since she was a newborn. During this tough time, I also happened to notice that Jillian had alot of ear drainage every few days and just didn't feel like everything was right with her. I also felt like I was constantly treating her for ear infections every few weeks. I was always giving her the antibiotic ear drops that they give you post-tube surgery. I made an appointment with the ENT, just to talk to her about what had been going on since Jillian's surgery and what was to be considered normal when it came to ear drainage. I really had no clue, so I am glad I made the appointment now that it had been a few months since her surgery. Our doctor explained because Jillian was in daycare, even for only two days a week, it's enough for her to have frequent ear drainage and infections. Especially during the peak of the cold and flu season. With the tubes, her ear pain and discomfort is much less but it's not completely out of the ordinary for me to see ear drainage every few weeks. Our ENT looked at her ears and her tubes before we left and said the tubes looked great and that they were apparently doing what they were supposed to be doing, draining out any infected fluid. A few days after the appointment with the ENT, I noticed a new tooth popping through on Jillian's bottom gum. It all made sense. The ear drainage coupled with her teething was causing her not to sleep and to get up at night. It seems like as soon as I saw that tooth rearing it's ugly little head, she was back to sleeping like a pro. It was certainly a lesson learned for me as a Mom. The next time she is not sleeping well, I can chock it up to ears and teething, and not to panic that we are falling back into bad sleeping habits. I need to learn to just ride out the storm so to speak!!!! We had Jillian's follow up weight check last week and we received great news! Jillian gained 8 ounces and now officially weighs 18 lbs 8oz. She is still a little peanut and is only in the 5th percentile in weight but she is gaining weight so that is a good thing. She is also is 73.9 centimeters, or 2 ft 5.1 inches which is in the 20th percentile. Our pediatrician commented that with all of the antibiotics and ear infection issues that Jillian had, it may have contributed to her weight loss. Hopefully my little peanut will continue to grow and gain weight now that the major ear infection issues are behind her. Jillian has also had a fairly healthy month (Knocking on all sorts of wood here as I type this!) Besides her brief period of teething and ear infections, she has been very healthy! Jeff had a horrible case of the flu which lasted 5 days a few weeks ago and thankfully neither Jill or I got it. Lately it seems that when one person in our house gets sick, it was only a matter of time before we all did. Thankfully Jeff kept his germs to himself this time. It was a doozy of an illness, I felt so bad for him. Jillian is still a picky eater, however, she has made a lot of progress this month with eating new things!!! She now will eat hot dogs and pizza at school which is great!!! She also loves french fries and actually ate a few wafer fries from Chick Fil A without me cutting them up. She seemed to enjoy grabbing them with her hands and biting them herself. She also will now eat Entemann's mini-muffins and Pillsbury Cinnamon rolls. She is a bread girl through and through and also loves turkey and grilled cheese sandwiches. As far as fruits go, she loves applesauce, bananas, and even ate her first strawberry this weekend without making a face. Veggies are still our biggest challenge. My biggest veggie success is to make a can of Progresso soup and give her the carrots and celery. She likes them soft from the chicken broth so that has helped a bit. I tried making my own pureed veggies and hid them in applesauce but she was on to me before I even got a spoonful in her mouth. She spit is right out, even though it was covered in applesauce. For snacks, Jillian loves baby goldfish, baby teddy grahams, and mini club crackers. I have finally used up all of the puffs, mummums and yogurt melts in the house and will no longer buy her anymore. I want her to have more substantial snacks. I am bit saddened by this, it was such a huge victory when she started to eat them, it's sad to think that we are past that stage already. My baby girl also loves the Gerber Arrowroot cookies and has found a new love in home made Chocolate cookies. She only gets those as treats but it's so cute to watch her get so excited about them as we pull them out of the pantry for her. 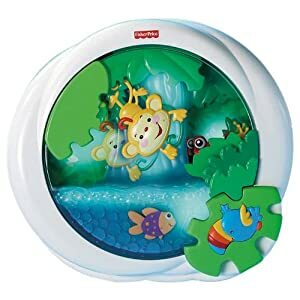 Lately my most favorite baby item has to be the Fisher Price Aquarium. Jillian has always loved her aquarium and used to always smile and coo at it as a baby. I now have a whole new appreciation for it. It helps her sleep!! Over the past month, Jillian will turn her aquarium on when she can't fall asleep right away and just listen to it while she is laying down. The soft music will eventually lull her to sleep. When I first realized what she was doing, I couldn't believe it. Even last night at 4am, I was awoken to the sounds of her aquarium coming from the baby monitor. I rolled over and picked up the monitor to find her laying down, one paci in her mouth, one paci in her hand, and her eyes wide open just listening to her aquarium. She eventually turned it on again and laid down a few more times and then eventually fell back asleep. She didn't even cry! I laid there just holding my breath, waiting for her to cry for me to come get her. But it never happened!!! It was awesome. She has really learned how to sooth herself to sleep over these past few months and I am just so grateful. Weight: 18 pounds 8 ounces (5th percentile). Clothing: I just put away Jillian's 9 month clothes a few days ago and she now fully in 12 months. She probably could get away with wearing her 9 month clothes a little longer but enough is enough. We have been wearing them for what seems like forever!! It's time for her 12 month outfits to get some use. She is still in 12 month jammies and suspect she will be in those for a little while longer. Height: 29.1 inches (25th percentile). Least Favorite Past Time: Diaper change. Teeth: 2 top and 3 bottom. The third bottom tooth on the right is just starting to pop through. Communication: Waving hello and good bye to everything. Claps all of the time. Says "Mama", "Dadda", "Baby", "Papa" and tries to say ball. She loves to giggle, laughs and give "smooches". Loves to play "So Big!" and "Where is Jillian?" It's been an amazing month with my sweet girl. I am curious to see if I will be writing about her walking for the first time in next months post. She is such a blessing to us, we praise God every day for allowing us to be her parents. Asher also loves to eat veggies and beans from soup, although he has a hard time eating them any other way. The soup really does the trick! Jillian is so cute! We have the same Fisher Price Aquarium and Leah will do the same thing, turning it on in the middle of the night to fall back to sleep, it's great! What a lovely update. My youngest who is 6.5 years old gets a lot more ear drainage and fluid in her ears during the winter months too. The allergist said it has something to do with the time of the year. A friend's son is the same way...so I'm guess that Jan/Feb/Mar is so hard on kids' ears in Ohio...I don't even have a little one and I'm so sick of ear infections, fluid in the ears, ear pain, etc. Jillian is getting so big! She's looking more & more like a little girl & less like a baby. I find that she's looking more & more like you too. Have a good week. Yay! Happy 14 months, Jillian!!! She is so stinkin' cute, she definitely looks like you. Thanks for the update on her, I'm thinking I should start this with Maura, she's going to be 6 months in a few days. Wow, I think I might have to get that aquarium!!! What a doll! Our little girls are only 3 weeks apart ;) Such a fun age.